There is really only one thing not to like about the Husqvarna 440E. If you set it down in the middle of the job, it’ll cool down so quickly that you’ll have to go through the whole starting process all over again. Other than that, this is about as close to perfect a mid-range chainsaw as a homeowner is going to find on the market. It’s dependable, safe, and easy on the user. Keep the chain sharp and it’ll do just about everything you ask of it (full disclosure: we didn’t ask it to clean up the garage). In terms of pure dollars, it’s definitely not the least expensive tool available, but it does so well with what it does that it’s still a great value for the price. Husqvarna has a reputation for making great chainsaws, and this one might be its best all-around one. If you have to get by with just one saw, this one is a serious contender. Husqvarna’s inertia-activated chain brake system takes a lot of the fear out of blade kickbacks. There you are, cutting through a fallen tree like it’s warm butter and you’re holding a red-hot katana. Suddenly, your blade hits a knot and jumps back at you. This situation was once every chainsaw operator’s greatest dread. It’s still scary, but it’s also when the sudden change in inertia activates this saw’s chain brake. A terrifying situation with potentially fatal consequences becomes just a terrifying situation. We’re not talking about a smell that will cause you to faint. We’re talking about a gas-powered chainsaw that is light and maneuverable, and that doesn’t shake a lot when you hit the gas. It’s comfortable and feels familiar. This cuts down on user fatigue. In turn, that increases the enjoyment of use and reduces the odds that you’ll get hurt. The 440E isn’t the most muscular chainsaw available. It’s also not the most portable. However, it excels just enough in both qualities that it’s one of the most versatile chainsaws on the market. It can cut through most trees with little trouble. It’s also light enough that you can position it to prune one limb while leaving the one next to it untouched. There are times when you just want power. There are times when you just want portability. For everything in between, you have the Husqvarna 440E. Chainsaws make their own mess, and some of that mess invariably winds up in the chainsaw through the air intake. Eventually, it makes your chainsaw less effective, and you have to stop working to clean it out. This costs time. Husqvarna’s centrifugal air intake system catches a lot of that debris before it gets to the air filter, and the saw’s design lets you clean it out quickly and easily. Over time, the air filter will get clogged up with little pieces of grit. The 440E has a quick snap release that makes accessing the air filter easy. Can you use this saw while working up high? Yes. It has a rear handle, but it’s light enough to be portable for working at heights. 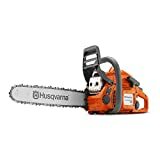 Is this chainsaw easy to start? This model comes with Husqvarna’s Smart Start feature. It should be no problem to start, even for people who lack upper body strength. The only hitch is that if you set this saw down in between uses, it cools down quickly enough that you’ll need to start it all the way back up. According to the Internet, the 440E is a very popular purchase. Users liked its power, its durability, and its portability in a saw intended for mid-sized jobs. We’d like to say it was more complicated than that, because it’s always a bit more fun to find out that a popular tool model has a dark side, but most of the complaints about the 440E had less to do with the saw than with the retail service it was purchased through. This applied to rookies, seasoned homeowner users, and professionals. This also applied to people of different body shapes. Some chainsaws are only usable by big, burly lumberjacks. People with small frames reported being able to use the 440E with little of the fatigue factor that excluded them from using other models. Husqvarna’s 440E is a popular mid-level chainsaw from a manufacturer with a good reputation for quality. The 440E is a popular mid-sized saw for very good reasons. It hits just about every note well, including the price. It’s a snap to use, delivers great power, cuts just about everything except the largest trees, and does all this with the latest features intended to promote safe, comfortable use. You’ll pay a little more than you would for most other chainsaws, but you will definitely get more than your money’s worth.